Ok - so your model agrees with the IPCC - 0.86C past warming, 1.5C linear trend for CO2 doubling with no feedbacks (NB: IPCC actually estimates 1.2C). You've essentially came up with the exact same historical attribution as the IPCC. Now, what about the future? You don't include feedbacks in your model, nor do you test against ice age and interglacial data (hint: you likely can't without feedbacks). 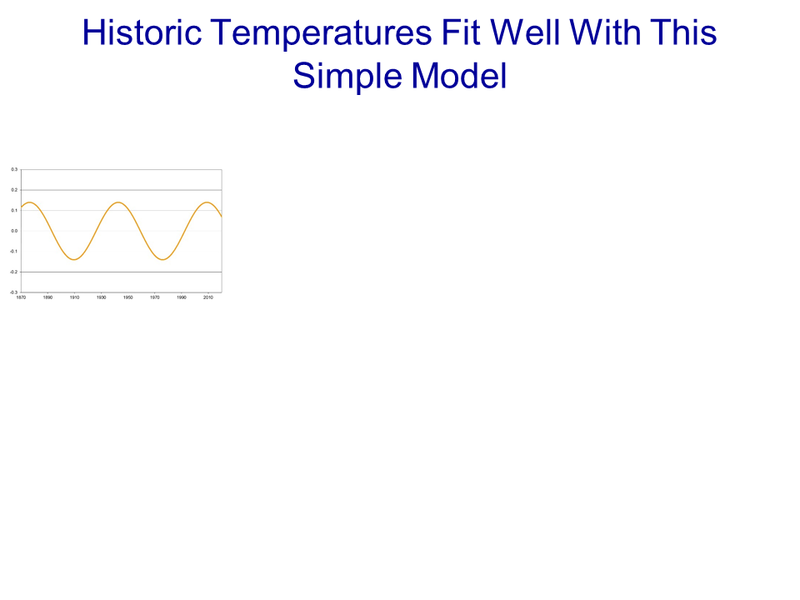 Presumably, once you have a model that can get into and out of an ice age, explain large volcanic eruptions, etc. you're essentially going to end up where the IPCC is today. 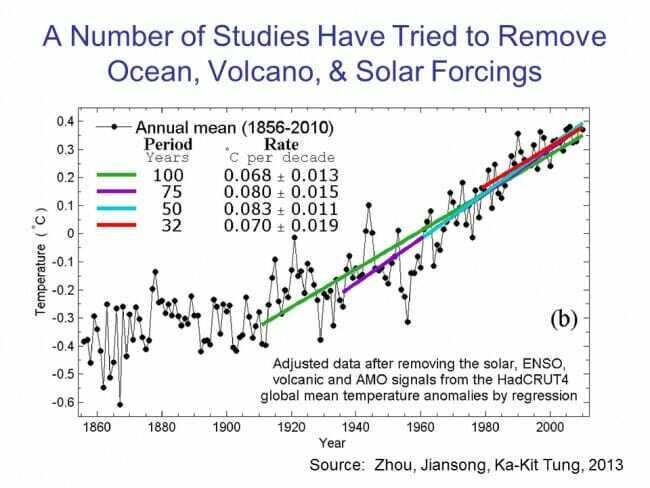 Will you change your mind then, or will you go back to the surface-temperature-data-is-crap argument (or one of the many others)? 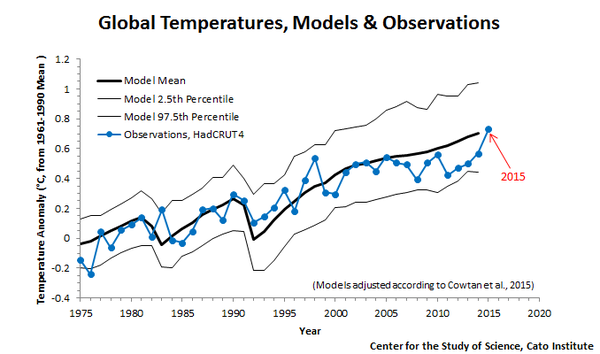 I think you are missing the point that climate modeling is a crapshoot and climate factors are poorly understood. 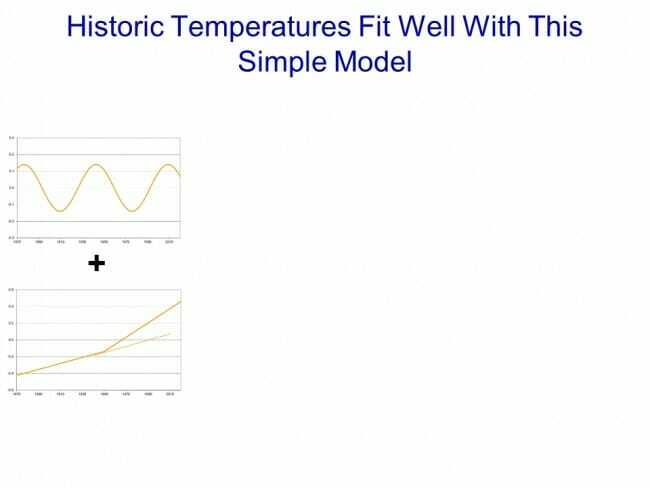 As Warren states, he made a simplistic model just for fun. He would certainly be the first to agree that it cannot possibly account for all variables. 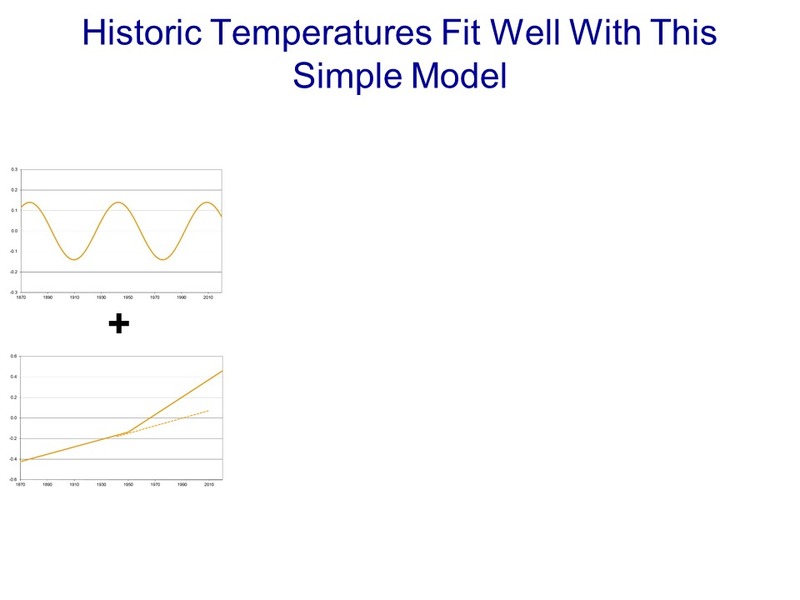 In fact, that was actually the point, to try and see how a overly simplistic model does. I also recommend you read his previous articles and take down your straw man ("the surface-temperature-data-is-crap" is at best a distortion of his opinions). I also like how you put words in his mouth regarding surface temp numbers and also how you assume massive positive feedback will happen any day now. What about the future? Wait for it to happen, and see how well his model performs. The same as with any other model projection. Don't know if it is based on something Warren has said before or whether it is independently arrived at or whether Warren is aware of it. But worth considering, especially if independently arrived at. The AMO/PDO cycles highlight the incompetence of the climate scientists or highlights the dishonesty of the climate scientists. 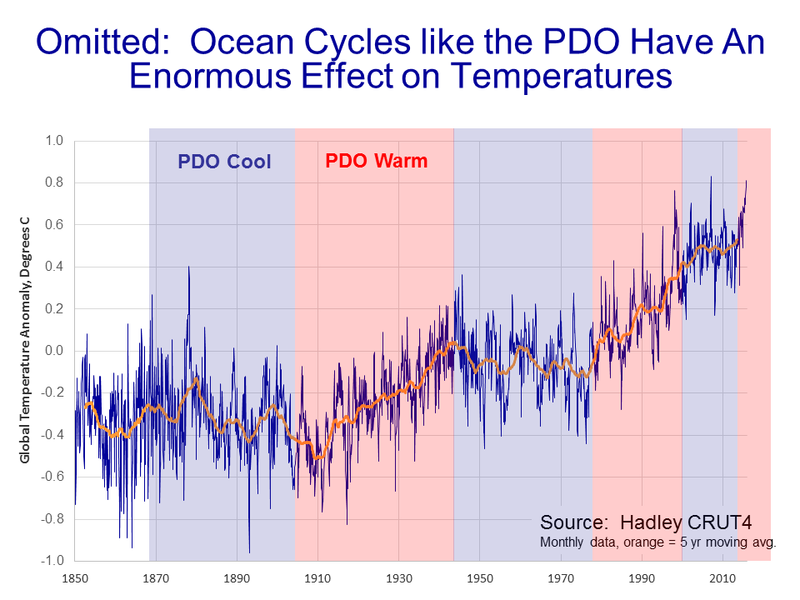 The AMO/PDO cycles have been known since the mid 1980's (they may not have known what they were until the late 1990's ) but they have definitely shown up in the temp reconstructions. 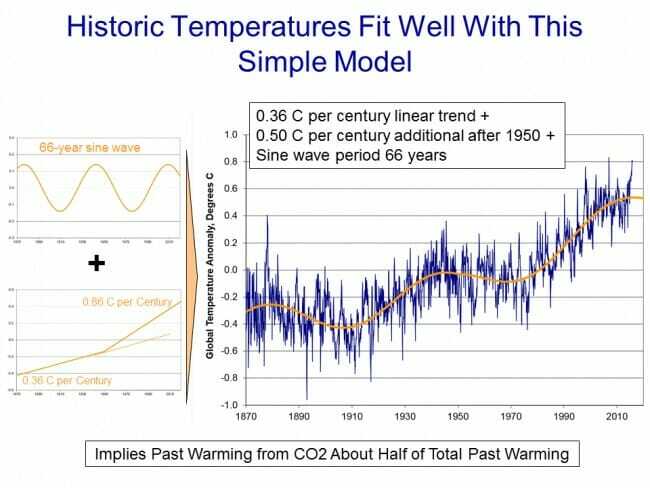 To have omitted the effects of the cycles from the models shows that either A) the climate scientists had no clue that the existed even though they were prominent in the historical temp records or B) the climate scientists were trying to blow s**t by everyone. 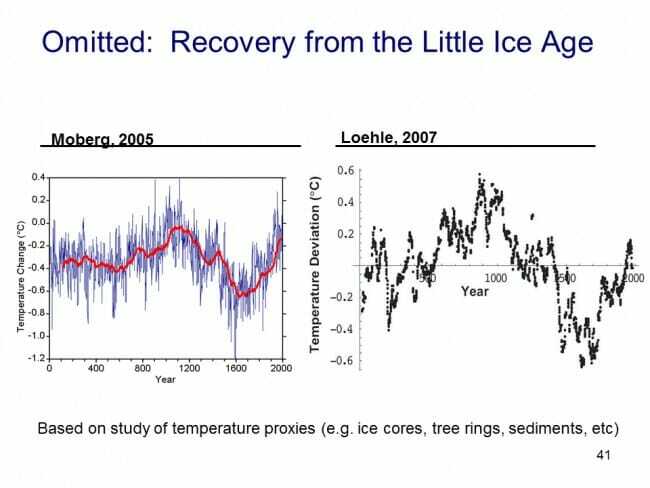 The subsequent climate science cover story aptly highlights the continued incompetency and deception of the climate scientists where very few have acknowledged that the warming side of the cycles may have contributed to warming whereas the typical climate scientists espouse that the cooling cycle is the reason for the pause but deny the warming side of the cycle contributed to the warming. See Mann study from 2005 as an example of the typical climate scientist explanation. > What about the future? Wait for it to happen, and see how well his model performs. The same as with any other model projection. You misunderstand the goal. The goal is scenario planning, which requires a model that can be fed different assumptions. Without modeling the variables, the best you can say is "if things in the future look like things in the past, we expect current trends to continue". Of course, we know that things in the future will decidedly *not* look like things in the past...so that's not very useful. First - learn some reading comprehension before accusing someone of something. Particularly, note the difference between (and I'll highlight it for you, since you're evidently still new at this): "*THE* surface-temperature-data-is-crap argument" and "*YOUR* surface-temperature-data-is-crap argument". Second, yes, it is a paraphrase - but I don't think it's a particularly objectionable one. 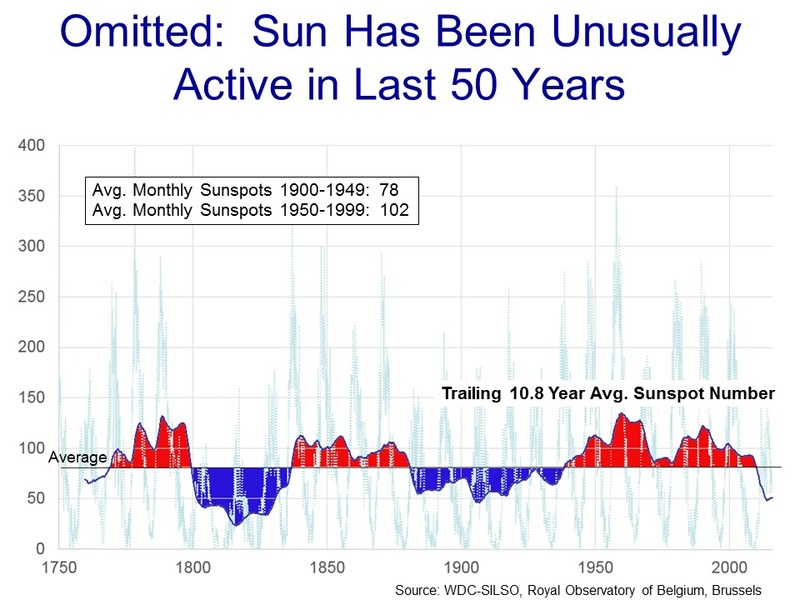 Post 4b of this series is literally entitled "Problems With The Surface Temperature Record" and goes into quite a bit of detail of potential issues. 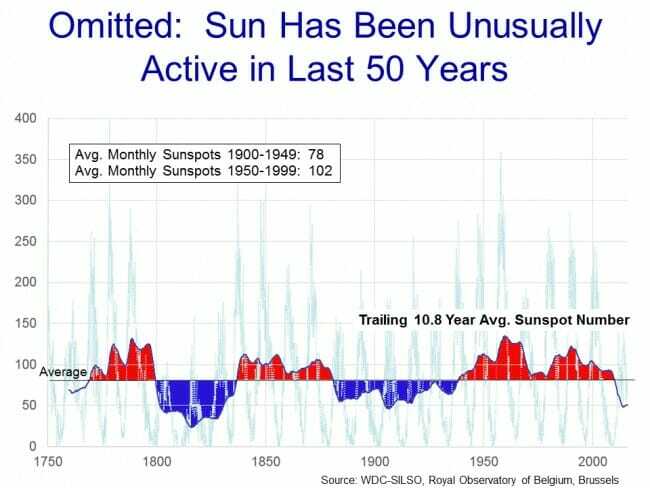 "This is one other reason why I tend to favor the satellite measurements...the satellite temperature metric had about 2/3 the trend of the surface temperature reading, or almost exactly what the surface readings would be if this siting bias were eliminated." "they are not eliminating the urban bias...they are just spreading it around to other stations in the region." I did no such thing. I did assume that he would need to model feedbacks to account for paleoclimate data (since that's what other researchers have had to do) and that once he did so, that his model would then come up with similar results for future scenarios as well. I don't see how that's objectionable - that's just math. > He would certainly be the first to agree that it cannot possibly account for all variables. Well, since his model agrees with others that *can* account for more variables (not necessarily, or even likely, all variables - but that's irrelevant) - why don't we use one of them? > In fact, that was actually the point, to try and see how a overly simplistic model does. I support that line of questioning. 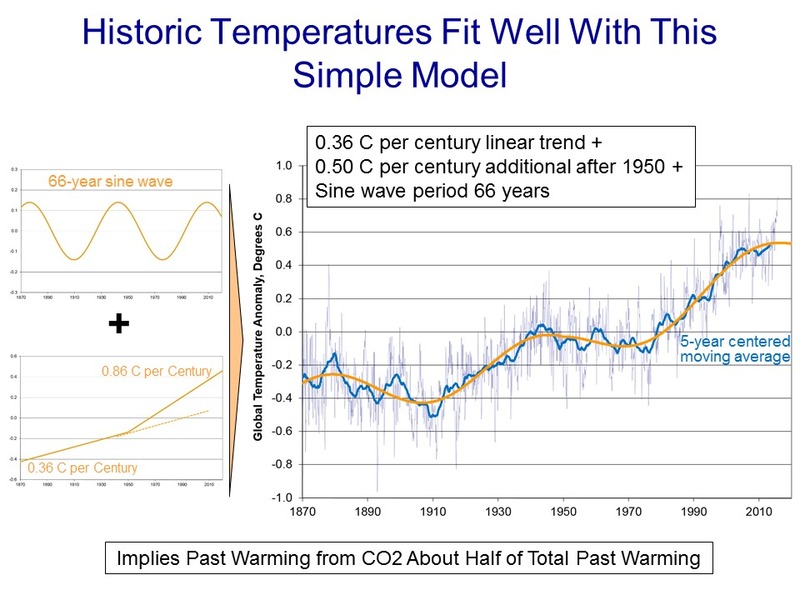 My question is that now that he's validated the IPCC models, what next? Does he have a plan for invalidating them? Does he accept them? Were we not really testing anything? > I also recommend you read his previous articles. > take down your straw man ("the surface-temperature-data-is-crap" is at best a distortion of his opinions). Not really a strawman, since I didn't attack it. Inflammatory? Yeah, probably. Distortion? Well (see above), I wasn't explicitly referencing his own arguments. And though it's devoid of nuance, I don't think it's much of a distortion of the larger skeptic communities arguments. 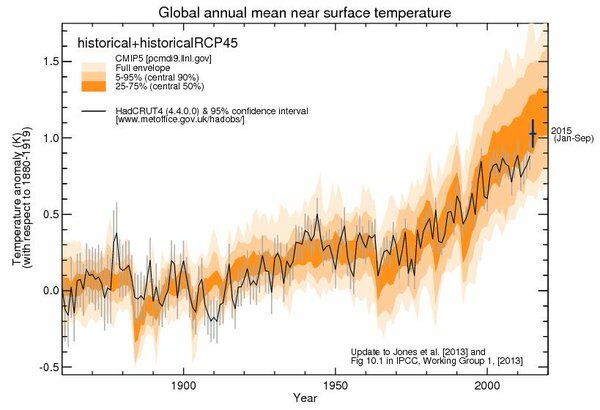 I also think it's an important question to consider - if his model ends up repeating the IPCC predictions, is he leaving the criticisms of the surface record alone? Or is he falling back on them as a way of invalidating his model? If the latter, then I don't really see a point in going through this modelling exercise - just attack the surface record. We have no idea if the future will look like the past until it gets here. Warren's projection could turn out to be far more accurate than more complex models. > Warren's projection could turn out to be far more accurate than more complex models. Warren's "model" is useless, because his only independent variable is time (which we can't control). He also used the entire dataset to train it, which makes validating it historically impossible. It hasn't told us anything new, it simply summarized the existing dataset with temperature = f(time). We could certainly wait and see if it's accurate, but that doesn't do us too much good right now - does it? 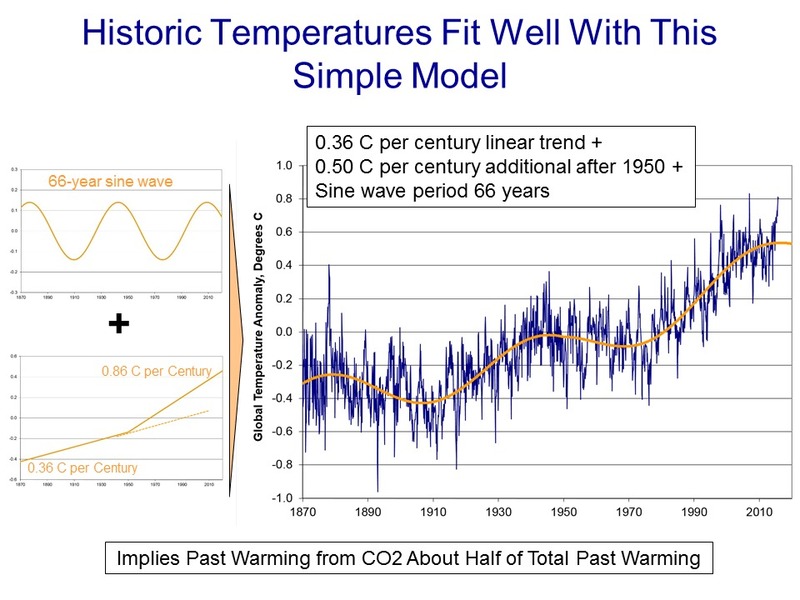 On the other hand, IPCC models that come up with the same result as Warren's are more akin to temperature = f(CO2%, NO2%, Solar, Ice%, Land%) which means we can actually use it to model a possible future. It's obviously possible the IPCC models are wrong for various reasons, but they've actually been tested against a range of scenarios, are consistent with other known observations, and can adequately describe other phenomena that Warren's model can't (which was my original comment - the simple f(time) function can't get you out of an ice age and then back in). People who are interested in the truth do not go on like this defending a complicated model based on authority. They begin with humility, skepticism and self-doubt. One does not have to read thousands of papers to understand that all complex systems are chaotic. Models of them fail completely at predicting inflection points. Unfortunately, it is precisely the inflection points we want the models to predict. In its essence, CAGW is a bet against skepticism, against the complexity of the reality contradicting the model. Obviously, all the scientists funded by public money in the world cannot prove that the model will not fail. Arguing its the best model available is no argument at all. Better models have failed in the past. What makes your model more failure-proof? Why can't it fail? If you want to persuade people more intelligent than you are you will have to show how your model is more like other models of complex phenomena that have been successful in the past (if any) and less like the very impressive models that repeatedly have crashed into the ground. Can you do that? 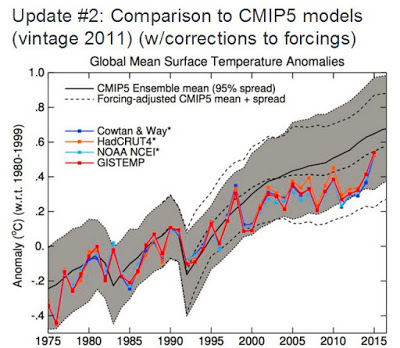 Models are only useful if they make accurate predictions. You can't verify any model until you wait and see if they do. The predictions made by the various IPCC models have been consistently high compared to actual measurements, therefore relying on them as your source for policy recommendations is worse than wrong, it's counterproductive. Aside from the fact GCMs don't predict, you are incorrect. Thanks, nothing in those texts refutes the charts I showed. "nothing in those texts refutes the charts I showed"
You're right. Were you trying to make a point with those charts? Yes, that the temps are back to being in line with the models. Easy to see. 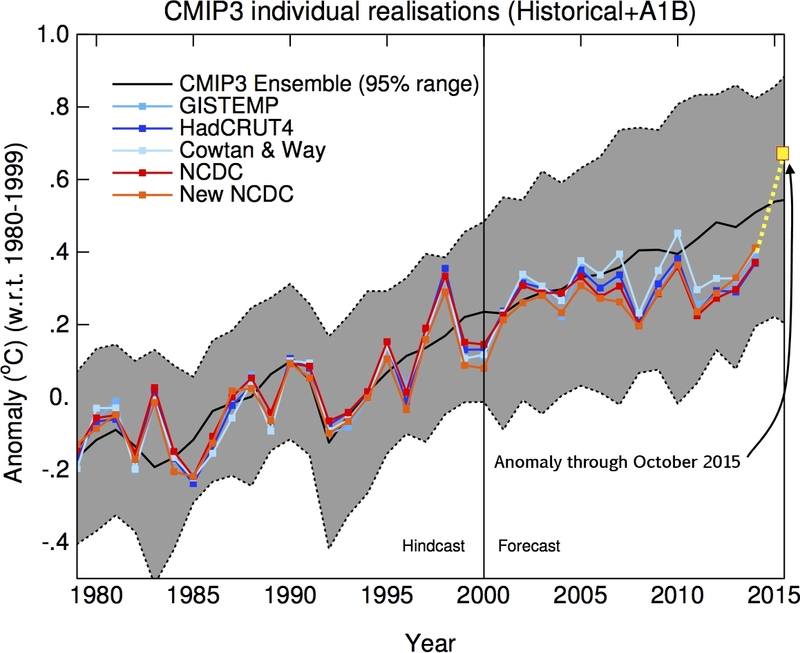 Cowtan, K., et al., 2015, (Robust comparison of climate models with observations using blended land air and ocean sea surface temperatures. Geophysical Research Letters, 42). The authors of the paper ADJUSTED the model to match the method used to compile observation data. 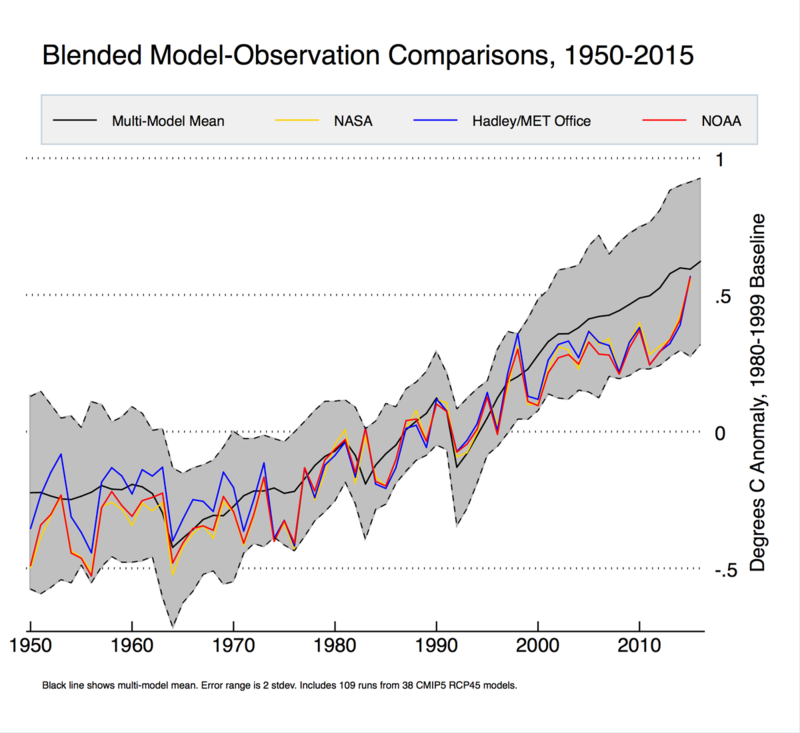 This is a good thing, they were able to account “for 38% of the discrepancy in trend between models and observations over the period 1975-2014.” However, that leaves 62% unaccounted for meaning the model still runs hot. I like how you go to Cato and ClimateAudit for your science. Your the one that posted the Cato chart. I know - even the Catos of the world know about temps and models! Praise be!